Definition: Antioxidants (sometimes called “free-radical scavengers”) are compounds that inhibit oxidation. Oxidation is a chemical reaction that can produce free radicals, thereby leading to chain reactions that may damage the cells of organisms. It can prevent or slow damage to cells caused by free radicals, unstable molecules that the body produces as a reaction to environmental and other pressures. Antioxidants such as thiols or ascorbic acid (vitamin C) terminate these chain reactions. To balance the oxidative state, plants and animals maintain complex systems of overlapping antioxidants, such as glutathione and enzymes (e.g., catalase and superoxide dismutase), produced internally, or the dietary antioxidants vitamin C, and vitamin E.
The sources of antioxidants can be natural or artificial. Certain plant-based foods are thought to be rich in antioxidants. Plant-based antioxidants are a kind of phytonutrient or plant-based nutrient. The body also produces some antioxidants, known as endogenous antioxidants. Antioxidants that come from outside the body are called exogenous. 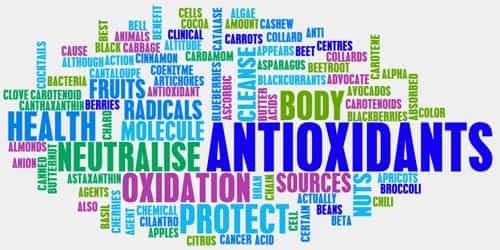 The term “antioxidant” is mostly used for two entirely different groups of substances: industrial chemicals that are added to products to prevent oxidation, and naturally occurring compounds that are present in foods and tissue. The former, industrial antioxidants have diverse uses: acting as preservatives in food and cosmetics, and being oxidation-inhibitors in fuels. There is a huge variety of different antioxidants found in foods. They can be broadly categorized into two groups, water-soluble and fat-soluble antioxidants. Flavonoids: A large group of antioxidants found in plant foods. They have many beneficial health effects. Importantly, antioxidant dietary supplements have not yet been shown to improve health in humans, or to be effective at preventing disease. Additionally, supplementations with selenium or vitamin E do not reduce the risk of cardiovascular disease. 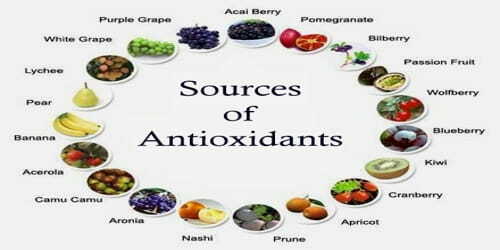 Health Benefits of Antioxidant: Antioxidants come up frequently in discussions about good health and preventing diseases. These powerful substances, which mostly come from the fresh fruits and vegetables we eat, prohibit (and in some cases even prevent), the oxidation of other molecules in the body. The benefits of antioxidants are very important to good health because if free radicals are left unchallenged, they can cause a wide range of illnesses and chronic diseases. Although certain levels of antioxidant vitamins in the diet are required for good health, there is still considerable debate on whether antioxidant-rich foods or supplements have anti-disease activity. Moreover, if they are actually beneficial, it is unknown which antioxidants are health-promoting in the diet and in what amounts beyond typical dietary intake. Dietary antioxidants have been investigated for potential effects on neurodegenerative diseases such as Alzheimer’s disease, Parkinson’s disease, and amyotrophic lateral sclerosis, these studies have been inconclusive. There is a wide range of antioxidants found in nature, and because they are so varied, different antioxidants provide benefits to different parts of the body.